Wanna Work a Fireworks Show?? Come make some new friends and celebrate our nation's birthday in style! Do you love the Fourth of July?? Want to celebrate our nation’s birthday in the most spectacular way?? Do you love fireworks and always wanted to work with the big stuff? Guess what?! We’re seeking crew to assist in the production of a major fireworks show on the Fourth of July. This is a truly unique experience and a lot of fun!. 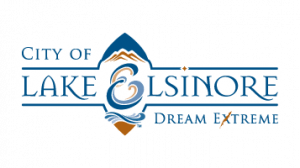 This show is for the City of Lake Elsinore and is the largest show in the Inland Empire. You will be working hands-on with professional pyrotechnics effects and equipment. You’ll watch the show right from a couple of hundred feet away! It’s a lot of work, but truly a rewarding and enjoyable experience. July 3rd & 4th, 2018. The start time is 7:00 AM PT both days. The end time is dependent on when the show is shot and when we finish cleaning up. You should not expect to leave before 7PM on July 3rd and no earlier than 12AM on July 4th. There are several breaks and rest periods throughout the day. For July 4th, we are shooting on the Lake Elsinore Levee. The levee is located about 2 miles behind their minor league baseball stadium. The coordinates of the firing site are 33.651268, -117.334952. Check out https://goo.gl/zrqpEl to see a map of the firing location. A detailed map, driving directions, and parking permit will be provided in advance of the show. Showtime! You will watch the show from the show command station. Maybe even shoot the show! You will be working under the direction of the crew chief and experienced crew direction. No experience? No problem. We will teach you everything you need to know. The first part of the day is off-loading the show truck. Once the necessary equipment is on the ground and positioned we will be loading the show. 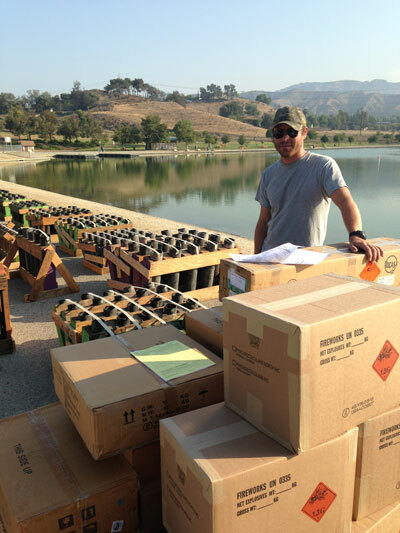 Loading the show consists of cleaning the firework mortars, addressing the mortars and loading them with fireworks. At show time, you will be strategically positioned to watch for safety issues that might arise. Once the show is completed, we will strike the site, clean up the site and reload the truck. You are expected to be thoughtful and safe in all your actions. You will be working with live fireworks. You are expected to bring basic tools with you. It is recommended that you bring a hammer, work gloves, and sunscreen. There will be a small stipend to help offset your expenses. The stipend provided to the crew depends on the show expenses. In prior years it has averaged to approximately $50-75 per day. The exact amount will not be determined until after the show and at the sole discretion of the crew chief. Additional compensation may be provided depending on years of service and experience. This is more of a fun experience than a for-profit job. We pay what we can, but it isn’t much. Please do not do this for the money. Please apply because you think this will be fun and you enjoy working outside. All meals on July 3rd and 4th will be provided. Including breakfast, lunch, dinner, snacks, and drinks. There is a pre-show BBQ and crew party on the evening of July 3rd. Your friends and family are welcome to come watch the shows. We have a friends and family BBQ on July 4th prior to the show. We have a special viewing area where they can watch. If you want to avoid the commute, you’re welcome to stay on-site. Camping accommodations will be provided from July 2nd and departing on the morning of July 5th. We have plenty of room for camping or RVs. There will be a 20x20x8 shade structure which you can put your tent under. There will also be a solar shower, a camp kitchen, power, and bathroom facilities on site for everybody to use. It should be a lot of fun! Please join us! You will receive a July 4th t-shirt. 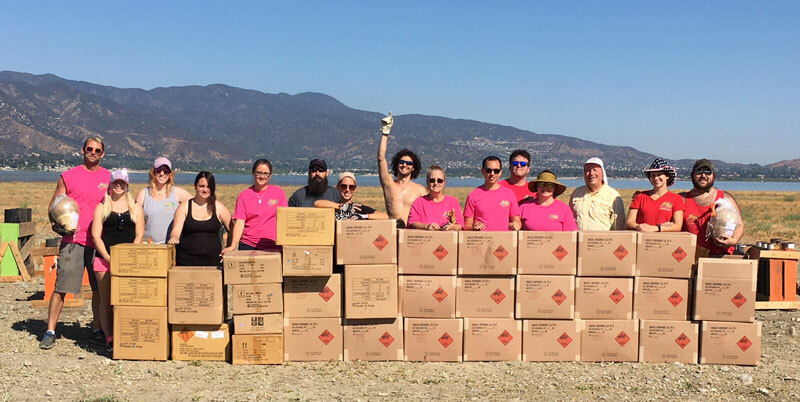 If you’re interested in pursuing your California pyrotechnic operator’s license, we can provide additional training, contacts in the industry, credit for one show and possibly a letter of recommendation. 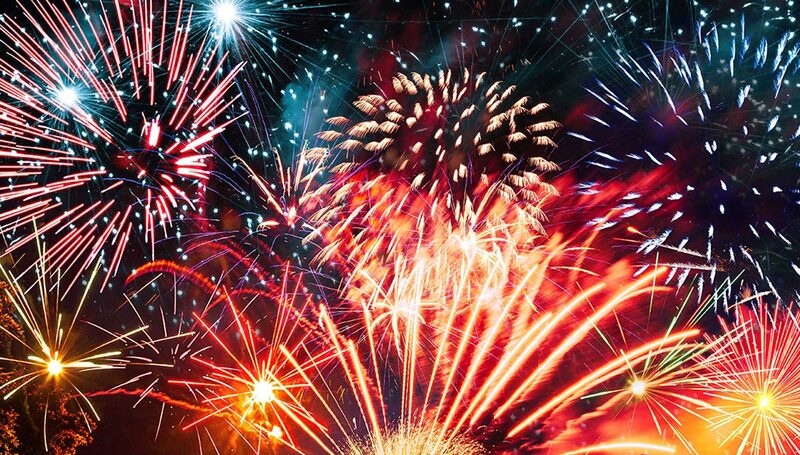 Click here to read more information about getting your fireworks license. The show and production company are fully licensed, fully insured and meet all legal requirements. You may not have a felony criminal conviction or have any other criminal record that may preclude you from handling explosives. All crew will be required to meet all local, state, and federal guidelines. You will be required to complete an Employee Possessor Questionnaire of the ATF prior to the event. It is recommended at you be able to lift at least 20 pounds multiple times throughout the day. This does not prevent you from joining the crew, but please let the crew chief know if you have any preexisting conditions so we can plan accordingly. You must be able to arrive and depart according to the show schedule. You must be able to stay until the show is over and cleaned up. Leaving prior to the completion of the show will result in the revocation of your stipend. You may not consume any alcoholic beverages or any non-prescribed narcotic during setup or during the show. Any consumption of alcohol or non-prescribed narcotic will result in immediate dismissal. This event is 100% outside in the summer of California. Temperatures will range from 60 degrees in the morning to over 90 degrees in the afternoon. We will take many breaks throughout the day, there will be multiple shade structures, plenty of cold drinks, but you should be comfortable with working outside. You agree to take responsibility for any friends or family that you invite to the friends and family July 4th BBQ and hold them to the same standards as the other crew. If this is your first show, you agree to complete Rank Zero of the Pyro Spectaculars training program. This program is FREE and will give you enough working knowledge to be productive and safe at the show. You can sign up for the program by clicking here. Please have a good attitude, enjoy working outside, and hard work. It’s the Fourth of July after all! Excited???!!! Hope so! Start your firework training today by signing up for the Pyro Spectaculars Blast Off Training. This training site will teach you everything you need to know to get started being a licensed operator. It includes helpful information on how to get started, basics of working a fireworks show, and important safety information. Click here to sign up for a FREE training account. 4 PM — Crew Chief will be picking up the truck and heading to the firing site. 7 AM — Crew Call Time & Breakfast. We will have breakfast and a show planning meeting at 7 AM. We will discuss the plan for the day and assign jobs. 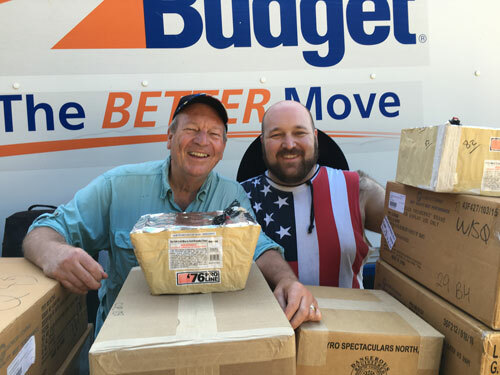 7:45 AM to 12 PM — Unloading the truck and setting up July 4th show. 12:45 to 3 PM — Unloading the truck and setting up July 4th show. 3:30 to 5 PM — Set up July 4th Show. 7 AM — Crew Call Time & Breakfast. We will have breakfast and a show planning meeting. We will discuss the plan for the day and assign jobs. 12:30 to 4:30 PM — Dropping and wiring shells. 8:00 PM — Show call-time for the crew. Meet at Steve’s RV. 8:15 PM — Mandatory crew safety meeting. 9 PM — Showtime!!! Light ’em up!! 9:45 PM — Strike July 4th show. The equipment with an asterisk is required. If you want to watch the show from show control you will need ear protection, hard hat, and long sleeve/pants. If you haven’t shot a show before, below is a list of equipment you will want to have. Please, please, please bring your own equipment. Fire retardant clothes, no nylon (including long sleeve shirt/jacket, long pants (jeans) — If you have Pyro gear, please wear it. We will be hosting a friends and family BBQ and private viewing for the show. The potluck will start at 4 PM and will end at 7:30 PM PT. Please ask your friends and family that will be attending to bring a tasty treat of their choosing. We will have a BBQ that they can use if they would like to grill up something. For the safety of everybody, please ask them to leave their alcoholic beverages at home. They will watch the show from our base camp, about 1500 feet from the action. It should be the best view in town! More information forthcoming. Additionally, your guests will be held to the same standards as the working crew. You are responsible for their actions before, during and after the show. By attending, your guests agree to the same conditions as the working crew. Lastly, your guests are welcome to stay afterward and help with the show clean up. Any additional help would be greatly appreciated! If you want to avoid the commute, you’re welcome to stay on-site. 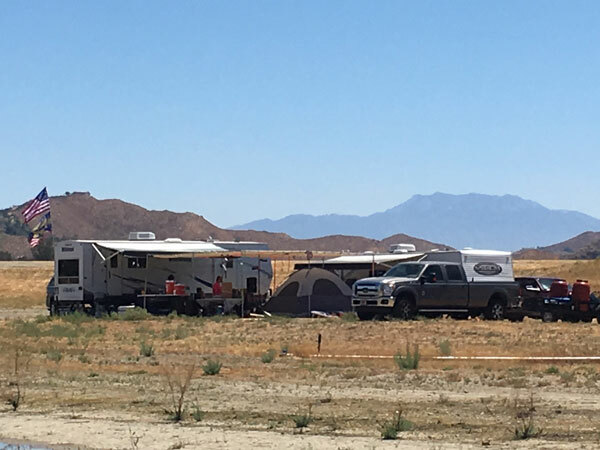 We have plenty of room for camping or RVs. There will be large a 20x20x8 shade structure which you can put your tent under. A solar shower, camp kitchen, power, and bathroom facilities will be provided on site for everybody to use. It should be a lot of fun! Please join us! Additionally, there are a number of hotel options around the firing site. This is not an offer of full-time employment with Yossio, MantisPRO, or Pyro Spectaculars. There are no additional benefits provided other than what is listed above. Crew members and their guests are volunteers. 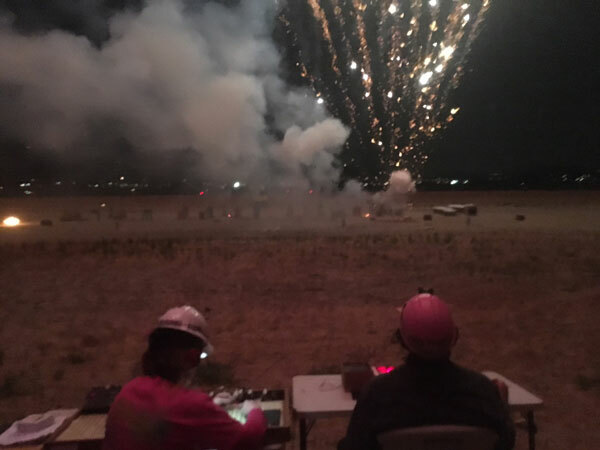 If you accept a position to work on this show you agree to follow all direction by the crew chief, senior crew members, law enforcement, fire service staff, employees of Pyro Spectaculars, Inc without question. If you accept a position to work on this show you acknowledge the inherent risks of working with pyrotechnic materials and working on an active show site. You accept the responsibility for your actions and the actions of any guest you invite for the show. By accepting a position on this crew you acknowledge and fully understand that as a crew member you are a volunteer. You will be engaging in activities that involve risk of serious injury, including permanent disability and death, property loss and severe social and economic losses. These risks include, but are not limited to, those caused by: (a) the actions, inactions or negligence of the event, participants, volunteers, spectators, event officials and organizers; (b) conditions of the premises or equipment used; (c) rules and regulations regarding the activities; (d) temperature; (e) weather; (f) condition of participants; and, (g) vehicular traffic. You further acknowledge and fully understand that there may also be other risks that are not known or foreseeable at this time. You knowingly and voluntarily assume all risk of property loss, personal injury, serious injury or death, which may occur by working a fireworks show and hereby forever release, discharge and hold all organizing parties harmless from any claim arising from such risk, even if arising from the negligence of Stephen M. Yoss, MantisPRO, Inc., Yossio, Pyro Spectaculars, its officers, directors, employees, contractors, agents or representatives, or by third parties, and you assume full responsibility and liability for your participation. Are you ready?? Sign Up Today! Don’t know? No worries! You can get me know later. Yes, I have read and accepted all the information on this page. I also agree to the terms and conditions of working on the show.